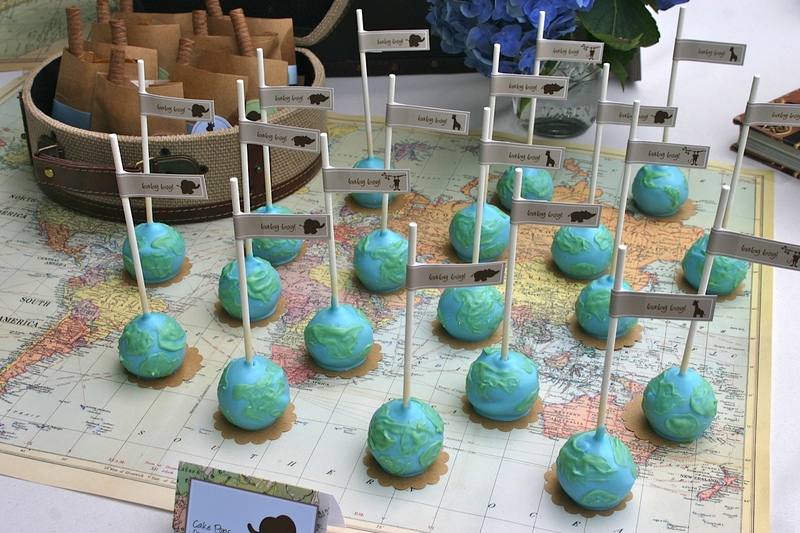 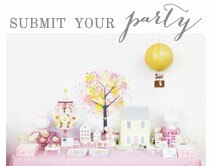 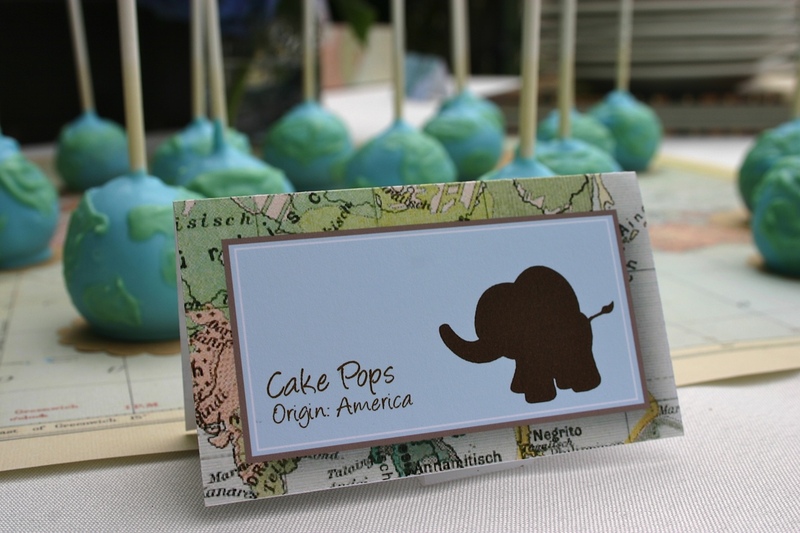 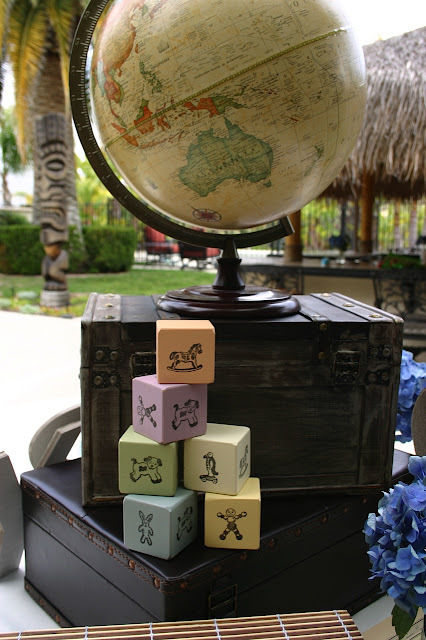 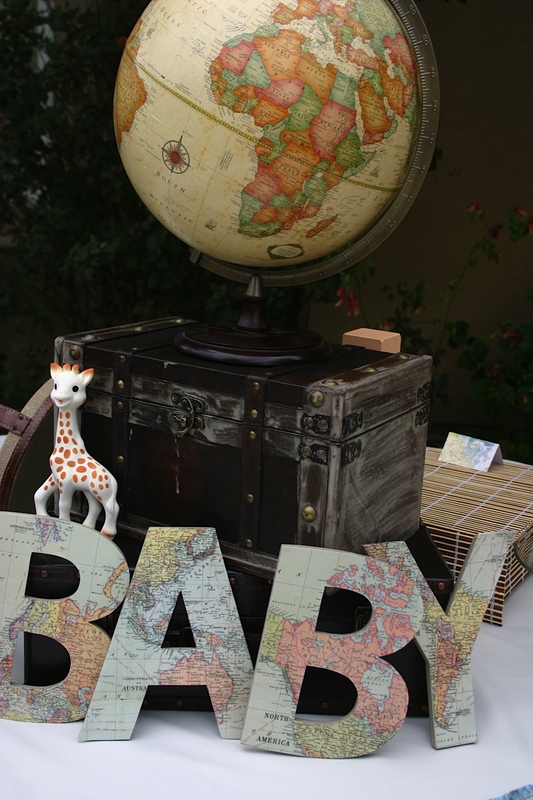 Lisa from Sweet Pop Studio sent in this gorgeous "Around the World" themed baby shower, I love the "world" cake pops, the globe, the wooden blocks, the vintage suitcases and all the sweet touches! What a beautiful event! 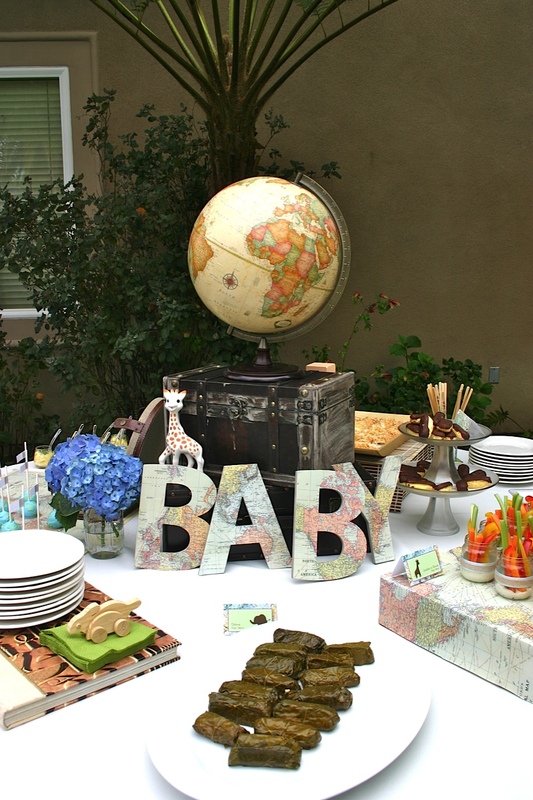 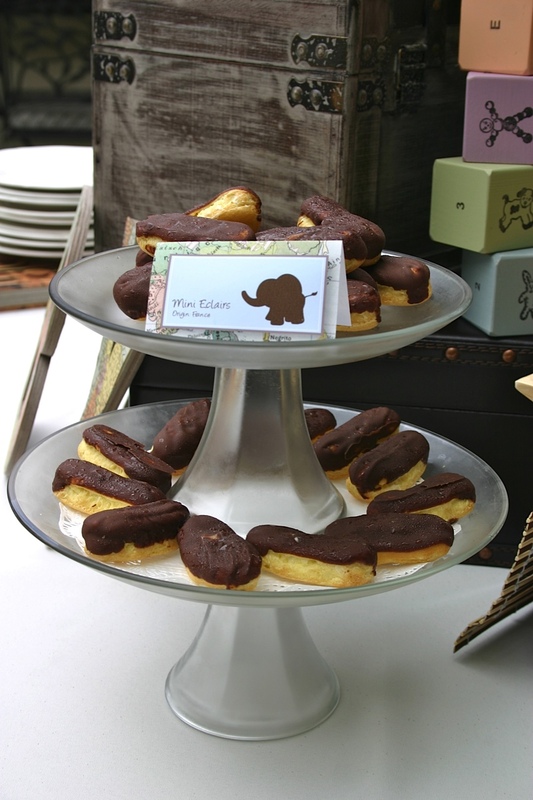 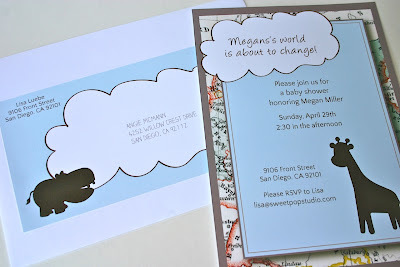 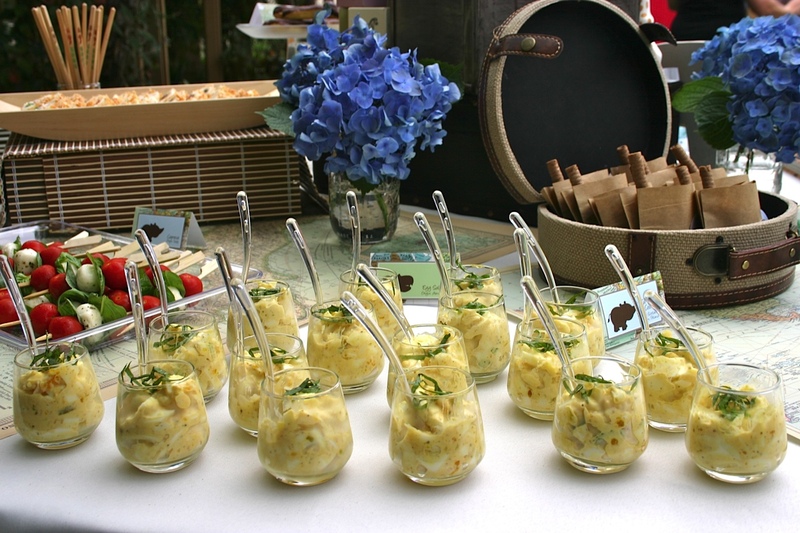 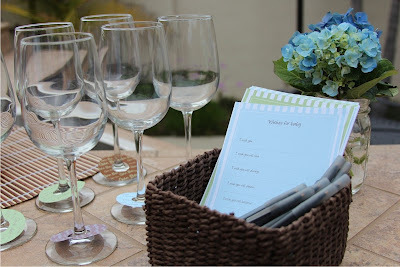 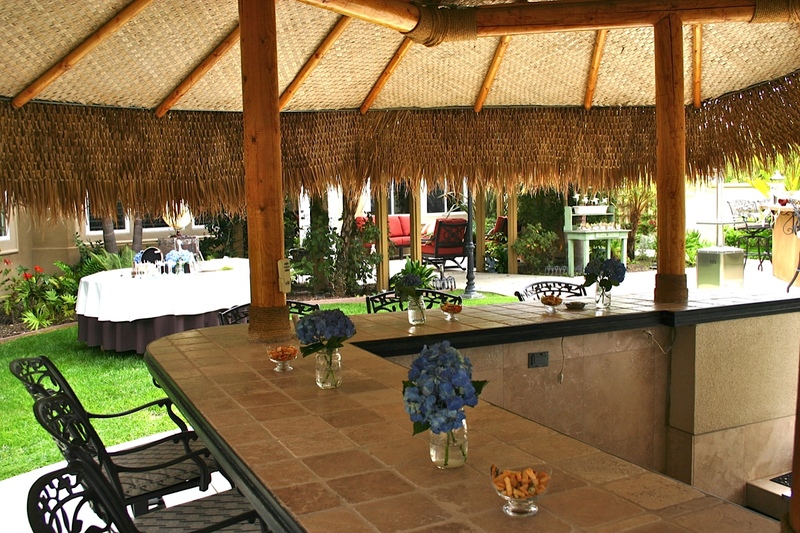 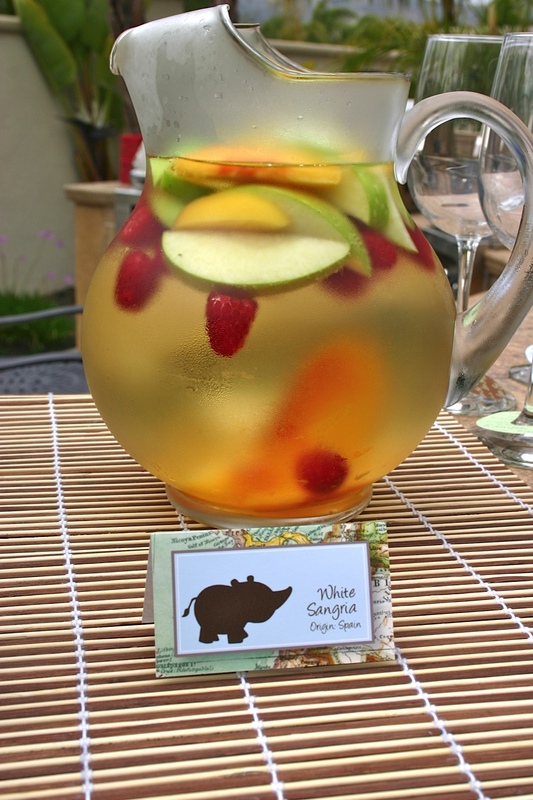 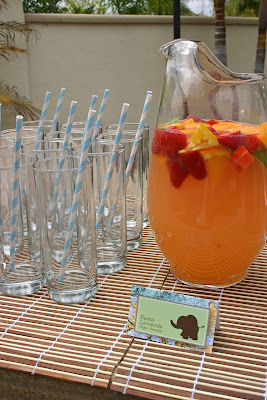 "A client hired me to help with a baby shower for her friend. 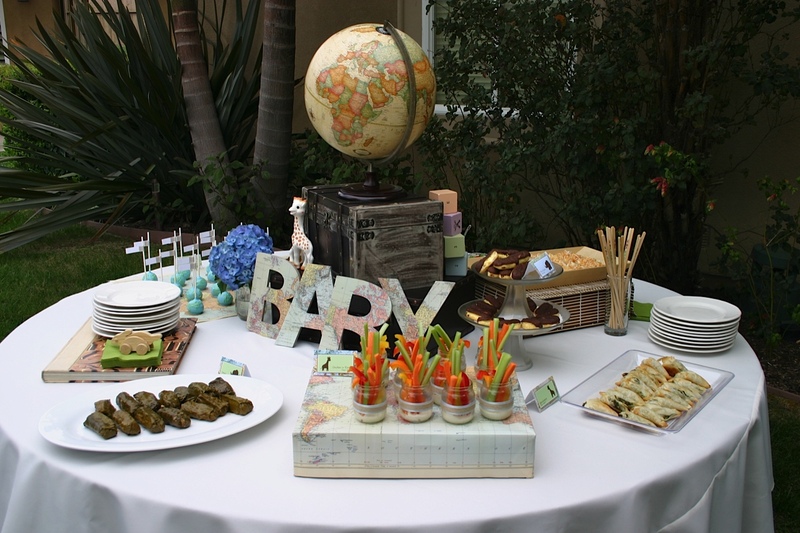 While thinking of themes she suggested an around the world theme since the new mom had just taken a trip around the world with her husband. 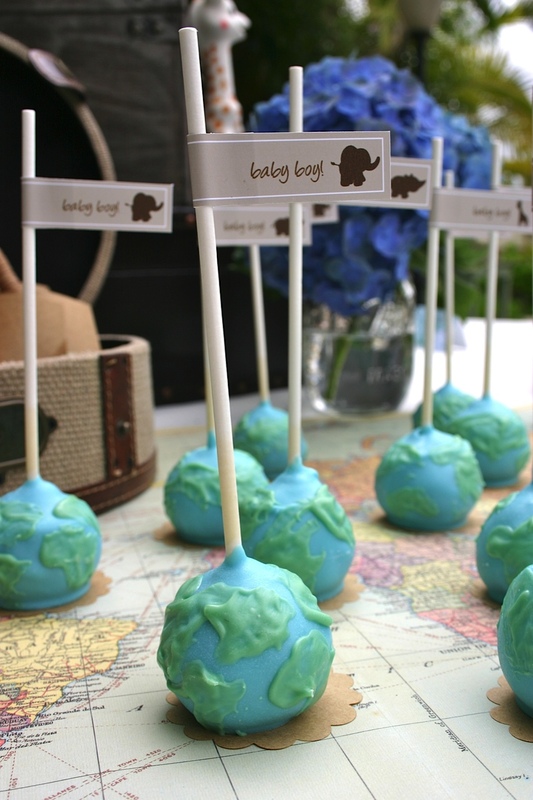 I didn't want to go with the traditional colors of the flags across the world, instead I decided on a vintage like travel theme and added soft blue and small details to bring in the element of baby. 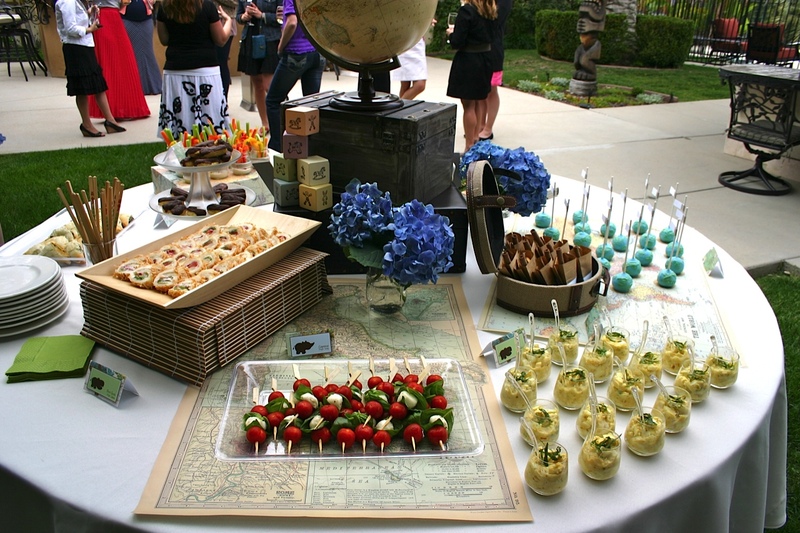 The focus table was the food and dessert table. I chose a round table to represent around the world. 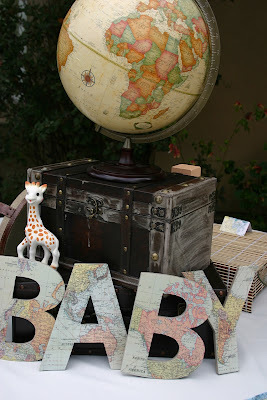 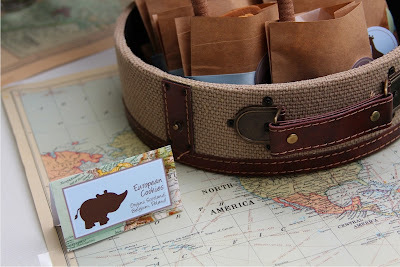 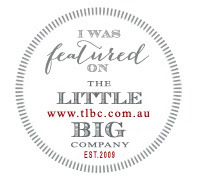 I used beautiful maps from The Paper Source, vintage like suitcases and trunk from Home Goods and Hobby Lobby. 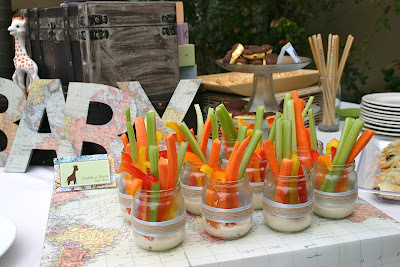 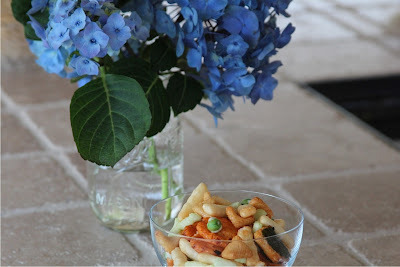 I put the vegetable crudites in baby food jars for that added baby touch. 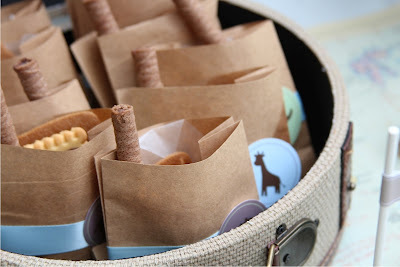 My favorite were the assorted European cookies in small craft bags wrapped in baby blue ribbon and an animal circle tag. The drink bar was filled with drinks from America, Spain & Mexico. 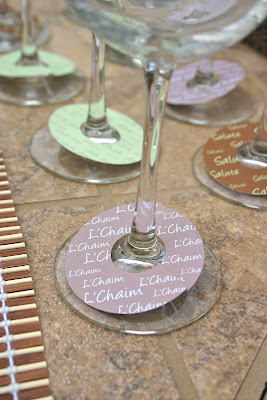 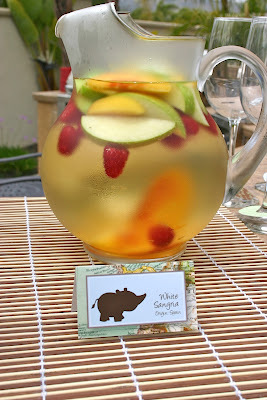 To identify your drink I made paper drink tags with cheers in languages from around the globe. The only flowers were beautiful, vibrant blue hydrangea. 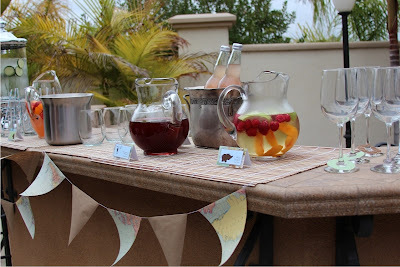 I saw a fabulous idea on Pinterest and knew I had to replicate it. 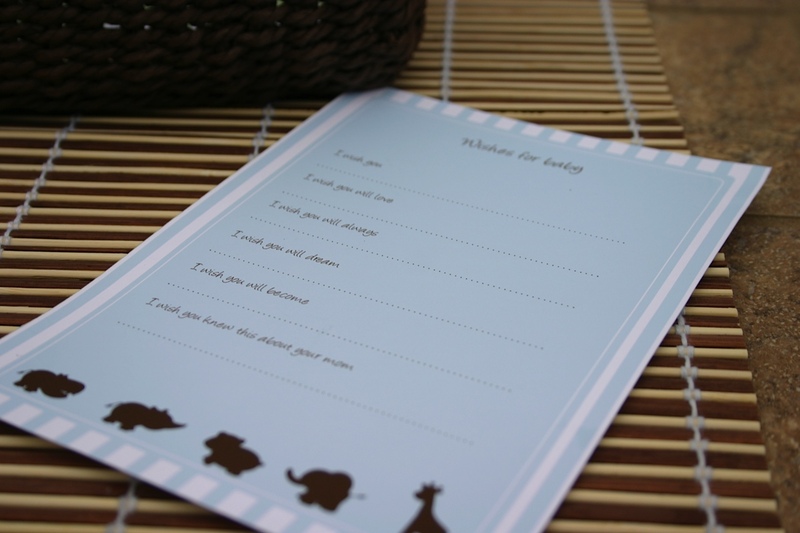 The Wishes for Baby was a sweet fill in message card for the baby's memory book. 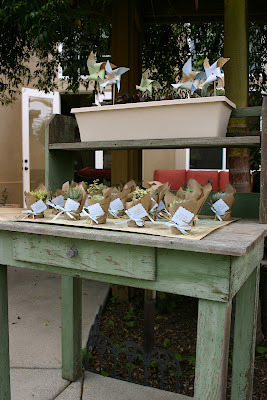 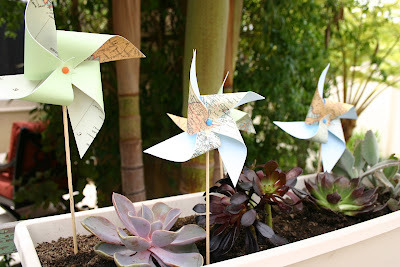 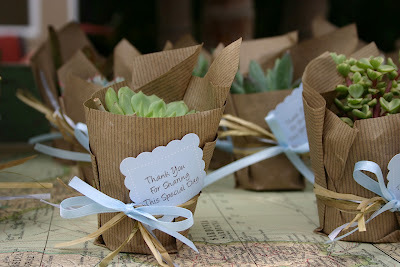 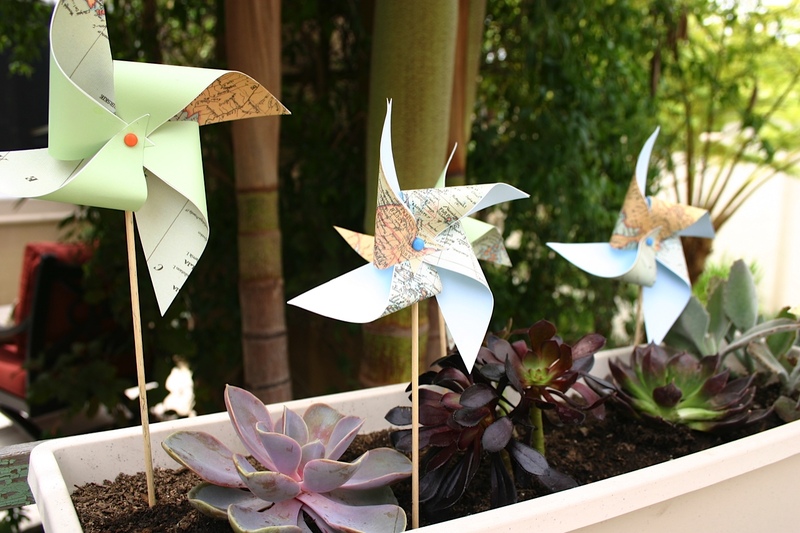 The favors were small succulents wrapped in craft paper and tied with raffia and ribbon and placed on an old and weathered garden bench"